NOTES: Be sure to read and fully understand these instructions before starting the installation process. These hoops are designed to run a shock with about 12-14” of travel on a vehicle with approximately 3-7” of lift. Proper shock length is determined by spring travel, vehicle use, and the placement of the bump-stops relative to ride height. This shock hoop can be installed with any ride height, but shock length must be varied for proper fitment. It is the sole responsibility of the installer to cycle the suspension and determine the proper shock absorber length prior to installation. Remove the bolts that mount the rear brake-proportioning valve to the frame rail. Remove the valve or CAREFULLY bend the lines to pull the valve assembly away from the frame. Fully clean the paint from the inside face of the frame directly above the bump-stop drop bracket on both sides. Place the shock hoop between the frame rails directly above the bump-stop drop bracket with the 3” square gussets between the hoop sides and frame. This may be a “press fit” and may even require a small amount of grinding to the ends of the hoop to allow proper fitment. 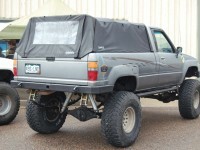 The hoop should be placed so that the shocks will be mounted toward the rear of the vehicle. When looking at the setup from the side of the vehicle with the rear suspension unloaded, the shocks should be angled with the bottom slightly toward the front of the vehicle, so that at ride height the shocks will be standing straight up and down. Before doing any welding, be sure that all brake hoses, fuel hoses, lines, plastic, etc. is protected from sparks by covering the items or removing them. Once properly aligned, tack-weld the hoop and gussets into place. Double-check the alignment of the hoop before fully welding. Carefully weld the hoop and gussets into place. We recommend welding the gussets to the frame on all 4 sides in “stiched” sections, leaving consistent small gaps to allow flex in the components. We then recommend fully welding the hoop to the gussets. Clean a 3”X3” section of paint from center of the rear face of the axle housing. This should be done so the center of this section is approx. 2.5” to the inside of the inner leaf spring U-bolt. Using a level or whatever tools necessary center and align the mounts on the axle housing, then tack weld into place. Double check the mount position. Fully weld mounts to the axle housing. Once everything has cooled, paint the bare metal on the frame, hoop, and axle housing. 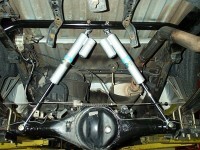 Once the paint has dried, install and fasten the proportioning valve to the frame rail. The brake lines will have to be re-bent to clear the shock hoop. Be careful not to “kink” these metal lines. Install the proportioning valve lever bracket on the axle housing. In some cases the proportioning valve lever may interfere with the shock body. If this is the case, we recommend relocating the proportioning valve axle bracket to the front of the axle housing, next to the differential. In doing this, be sure that the lever mount is placed at the same height it was at on the rear side of the axle housing. If using the same axle mount with a lift, we recommend raising the lever by way of bracket, if necessary, ORS can provide this bracket. Install the shock absorbers on the shock hoop with the provided bolts, nuts, and washers. Place one washer on each side of the shock eye. Fasten the parking brake cables to the levers. Re-install the spare tire and lower the vehicle to the ground. Cycle the suspension and check for proper shock clearance, length, and fitment. CAUTION: At times the rear brake proportioning valve actuating lever may have to be modified to clear the shock absorber body. With certain shock setups, we recommend using a set of larger bump-stops in place of the stock units. If interested, ORS can provided a set of bumpstops.